Hookham was born in London on London 9 November 1863 and was educated at Durham House School, Clapham Common, and in 1879 entered a five year pupilage under William Kirtley at Longhedge Works on the LCDR. From 1884 to 1887 he was an assistant draughtsman at Longhedge, but then worked in drawing office of Pulsometer Engineering at the Nine Elms Ironworks, Lambeth, on hydraulic and pumping machinery, and in the Glengall Ironworks, MilIwall, on marine engines, dredgers and barges. In 1891 he returned to the LCDR as an assistant draughtsman. Following the SER/LCDR agreement Hookham was briefly at Ashford between 1899 and 1900 and became Locomotive Superintendent of the Donna Thereza Christina Railway in Brazil between 1900 and 1902, but when this railway was nationalized in that year he returned to become Works Manager at Stoke on the NSR, becoming Locomotive Superintendent in 1915 upon the death of John H. Adams. He introduced soft iron packing for glands, oil-firing and feed-water heating. He also built a 4-cylinder 0-6-0T, in 1922, with the cranks set at 90o and 135o, to give an even torque with an 8-beat exhaust. In 1917 he designed and built a 4-wheeled battery loco which worked until 1964. At the grouping Hookham became mechanical engineer, Stoke on Trent. When he retired he moved to Devon and died in Exmouth on 24 January 1934. He became MIME in January 1904 and MICE in February1918. Photograph of him in his office in Stoke Works in Railway Archive (3) page 41 upper. Caption by Basil Jeuda notes that he had a reputation as a very good engineer on the works side and was ahead of his time in such operations as machining piston rods and packing. He was also considered a leader in using cast iron packing rings, supplying Gresley with information leading to their use on the GNR and LNER. Present in group photograph taken at Railway Centenary in Darlington: J. Instn Loco, Engrs, 1925, 15, 576 . Obituary J. Instn Loco. Engrs, 1934, 24, 611. Atkins, Railways South East, 1, 122. Results from trials with an 0-6-2T. John Henry Adams was born in London on 10 September 1860. He was the third son of William Adams and was educated at Brighton Grammar School and Thanet College, Margate, and privately in Brussels. In 1877 he was apprenticed under his father at Stratford, GER, and when his father became locomotive engineer on the LSWR in 1878 he transferred to Nine Elms Works. On completion of his training he served as a fireman for 9 months and was later driver of goods and passenger trains for 15 months on the LSWR. He then spent a year with Tannett, Walker & Co, Leeds, to gain experience in hydraulic engineering. From July1887 to September 1898 he was Locomotive, Carriage & Wagon Superintendent of the Donna Thereza Christina Railway in Brazil. In January 1899 he became assistant manager of the SECR works at Ashford, and in March 1902 he was appointed locomotive, carriage and wagon superintendent of the NSR, at Stoke in succession to Longbottom where he remained until his death. His colleague J.A. Hookham followed him from Ashford to become works manager at Stoke. Adams. introduced many improvements, he introduced the madder lake livery for NSR locos. He fitted all tender axle-box bearings with a 3/l6in (4mm) lining of white-metal and a lubricating pad in the bottom of the axle-box. He also introduced the 4-wheel bogie on engines and coaches, and from 1903 onwards he built all his new engines and nearly all his new coaches in the Stoke Works after reorganising them and equipping them with up-to-date tools (see Jeuda below). He was elected MIME in 1902. He died in Congleton on 7. November 1915. According to Marshall born Wakefield 2 March 1826 and died Stoke-on-Trent 12 February 1902. Apprenticed to Fenton, Murray & Jackson and then with E.B. Wilson. He then worked in several locomotive engineering firms before becoming engineer of the Kendal & Windermere Railway in 1855. When this line was taken over by the LNWR, he became locomotive district foreman at Tebay and the at Preston. He beacme Locomotive, Carriage & Wagon Superintendent on the NSR in December 1882. Responsible for introducing D class 0-6-0 (most numerous on NSR), 100 class 0-6-0 and DX 0-6-2T class, Noted in Joy's Diaries.. Illustrated Interviews: No. 39. Rly Mag., 1901, 8, 193. (includes portrait) where he is described as "Chief Mechanical Engineer" and stated that tank engines were most suitable for NSR traffic..
See Railway Archive, (2), 47. Locomotive Foreman of the North Staffordshire Railway from 1847 to 1874 when the post was redesignated Locomotive Superintendent. This he held until his death in 1875. He was succeeded by Charles Clare.Not in Marshall: see Railway Archive (1) p. 71. Also mentioned in Illustrated Interviews: No. 39. Luke Longbottom. Rly Mag., 1901, 8, 193. Locomotive Superintendent of NSR in succession to R.N. Angus. Not in Marshall. See Railway Archive, (1), 71. Also mentioned in Illustrated Interviews: No. 39. Luke Longbottom. Rly Mag., 1901, 8, 193. Son of Isaac Dodds.mentioned in Illustrated Interviews: No. 39. Luke Longbottom. Rly Mag., 1901, 8, 193. where he applied his father's wedge motion on the North Staffordshire Railway (but it was never made to work satisfactorily). The son also started locomotive manufacture at Stoke according to Longbottom. Main entry with father.. Manifold (Hollick et al) state that Johnson was the father of Samuel Waite Johnson and had worked on the GNR for sixteen years. They note that the Chairman of the NSR considered that Johnson "had queer views, and attached fireboxes not suited to the district, which had to be removed at great expence". From the Locomotive Magazine (1912, 18, 46) obituary it is clear that James Johnson was the father of the famous Samuel Waite Johnson. Born Pembrokeshire 14 September 1815; died Newcastle-under-Lyme, Staffs, 15 February 1879. Engineer and manager, NSR. His father worked on the LMR but was killed in 1844. Forsyth educated under John Dixon and in 1834 became sub resident engineer on the Newton-Manchester section of the LMR. In 1837, under T.L. Gooch, he prepared contract drawings for the Manchester & Leeds Railway. Later became resident engineer on construction of 7-8 miles of the MLR near Huddersfield until the line opened in 1841. From then he worked on plans or as resident engineer on several railways near Manchester and the East Lancashire Railway. In the autumn of 1845 he was engaged by G.P. 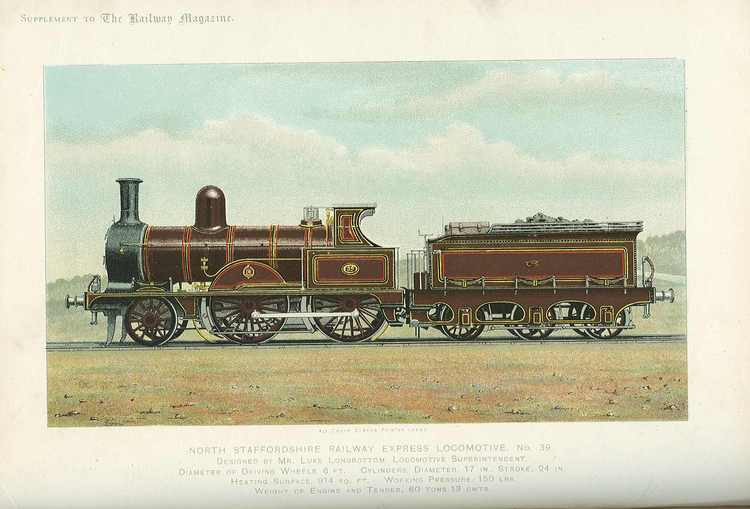 Bidder on plans for the North Staffordshire Railway for which Robert Stephenson, Bidder and T.L. Gooch were joint engrs. On the passing of the NSR Act in 1846 Forsyth became resident engineer on a large portion of the line until 1848, remaining as resident engineer until 1853. in that year the manager, S.P. Bidder, resigned and went to Canada, and F reluctantly accepted appoitment as manager in addition to his position as engineer until he resigned both in 1864. He then became consulting engineer and engineer for the construction of new NSR lines until his death..